Every now and then, we will attempt to write the worst sports column on earth. Today: Let’s talk about football justice. PATRIOT PLACE, MASSACHUSETTS — Peyton Manning is a true legend. For almost 20 years, he’s been slinging the ball all over the field, putting up big highlights and bigger numbers. You can’t stop him, you can only hope to contain him. Earlier this year, he broke Brett Favre’s record for the most touchdown passes in NFL history, and the masses started wondering again: Are we watching the greatest quarterback of all time? You can’t stop the narrative, you can only hope to contain it. Everything stopped when that record fell in Denver. Remember? There were fireworks, gushing tributes from the announcers, and even a few high-fives from the 49ers. You half-expected a parade to break out right there in the middle of the field. The entire Broncos team came over to congratulate him. The receivers played keep-away with the record-setting ball, a choreographed show that would have made Beyoncé proud. Up in the press box, writers raced to see who could call him “greatest” first. You have to think that Tom Brady and Captain Bill Belichick were watching all of this. You know they were. They were sitting in the football offices at Patriot Place, listening to Cris Collinsworth gush over Peyton like a schoolgirl, watching the fireworks light up the mile-high sky. I bet you Captain Bill saw all the regular-season hype, looked over at Tom, and channeled Lombardi. What the hell’s going on out here?!? The celebration was as excessive as it gets, but the officials didn’t throw a flag that night in Denver. The Patriots delivered the penalty instead. That was football justice we saw Sunday, delivered by two partners in crime who live by a code and haven’t died yet. The Patriot Way isn’t about records, it’s not about highlights, and it’s not about fireworks. Can you imagine Tom Brady becoming the all-time leader in touchdowns? They wouldn’t stop the game and hold a parade. In New England, they keep the duck boats docked until it’s title time. It’s the one key difference between two of the greatest quarterbacks in history. It’s the difference between a guy like A-Rod and a guy like Jeter. It’s the difference between Jadeveon Clowney and J.J. Watt. It’s the difference between looking great and being great. Brady has his eyes on something bigger than records. He’s playing for January. Belichick’s the same way. Sunday, they went out and sent a message. Nice record, Peyton. But the only numbers that matter in this league are on the scoreboard. Four-hundred yards through the air? Great stuff, Peyton. Just adding to the legend. But you lost a big game by 20 points. Just adding to the legend. It’s not that Manning doesn’t impress me. Nobody’s been this good for this long, nobody does more for his teammates, nobody prepares better. I get it. He puts up eye-popping numbers year after year after year. If you need a fantasy football quarterback, there’s never been anyone better. But this isn’t fantasy. This is reality. Or Sunday was reality, to be exact. Reality for everyone in America who spent the last few months slobbering over regular-season success. Marijuana’s legal in Denver now, but sometimes it seems like the whole country’s a mile high, too. We all get short-term memory loss when we talk about no. 18. Dazed and confused is no way to go through life, sports fans. 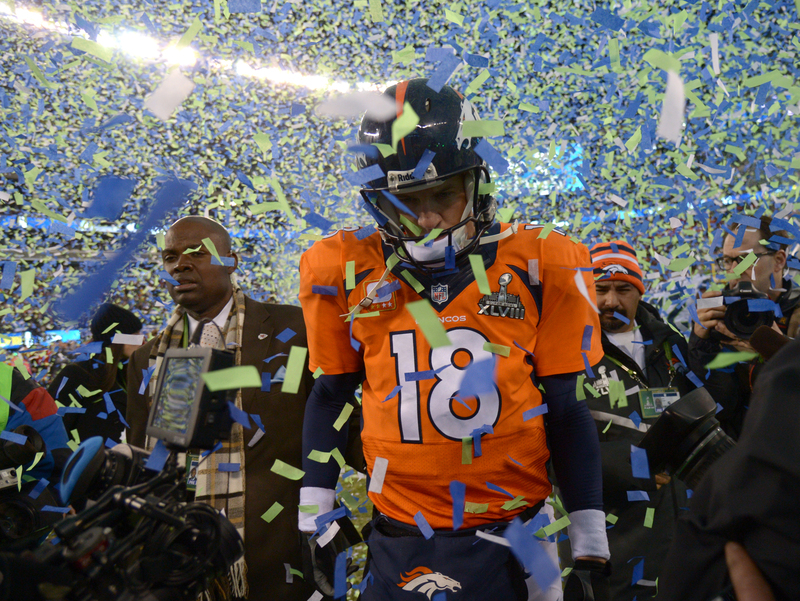 Just look at Peyton in last year’s Super Bowl. Somewhere along the line, we stopped demanding greatness from our greatest players. It’s no big deal when LeBron James loses a championship. We’re OK with it if Clayton Kershaw melts down when his teammates need him most. We don’t complain when the favorites pull up lame, because at least they ran hard. It started with Peyton Manning. If we worship a silver medalist long enough, eventually the gold standard gets tarnished. Maybe I’m just guilty of judging Manning like any other great player. Maybe Belichick and Brady spoiled me. I expect big numbers and big wins. With the greatest talents in the world, I expect greatness. Maybe that’s my job. Maybe that’s a sportswriter’s burden. The rest of you can be fans and enjoy all of this, but I decided a long time ago that it was time to put the pompoms down. That touchdown record was a nice moment for a player who’s had plenty over the years, but Sunday was our reality check. Sunday was a message from Brady: You can have the records. I’ll take the wins. Remember that the next time we see “the greatest ever” walking off a field hanging his head after another playoff loss. Remember this column when we watch Denver’s general get shelled on the front lines one more time. As soon as they blow the whistle on another playoff loss in January, a whole army of experts will swarm the battlefield with numbers. Explanations for why it happened, and why it doesn’t matter. Why we’re all missing the point when we focus on winners and losers. You want to talk historic numbers? Manning got the most touchdowns this year, but he’s always been the all-time leader in excuses. He can’t do everything, but he’s still great. You’re crazy if you let the playoffs and all the losses to Brady affect his legacy. Nobody’s ever been more impressive. Forget Super Bowls and just look at the numbers. In a few months, we’ll hear it all over again. Talk about a broken record.